These live courses are evidence-based, providing clinically relevant information and training the examination, evaluation and intervention of female pelvic pain and bowel dysfunction. Labs offer skills immediately applicable in clinic and include complete internal vaginal and rectal pelvic floor as well as external abdominopelvic examination and treatment techniques. Lectures include the anatomy, pathophysiology and physical therapy evaluation of pelvic floor dysfunction related to pelvic pain and bowel dysfunction in the female patient. Basic concepts of myofascial release, clinical application of modalities, female sexual response and sexual dysfunction will be reviewed. Clinical decision-making and an integration of skills acquired at CAPP Pelvic Health 1 will be included. In order to proceed to the Pelvic Health Physical Therapy Level 3 course, you must complete the Pelvic Health Physical Therapy Level 2 Bowel Dysfunction AND the Pelvic Health Physical Therapy Level 2 Pelvic Pain course first. Both courses must be taken to fulfill the Level 2 requirement. 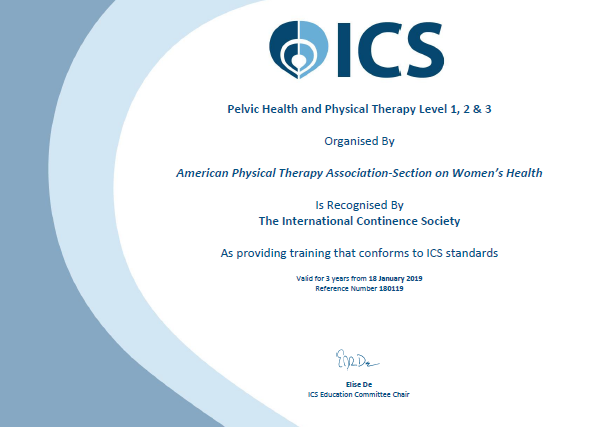 The Pelvic Health Physical Therapy Level 2 course is recognized by The International Continence Society (ICS) as providing training that conforms to ICS standards. Open to: Licensed Physical Therapists, Physical Therapist Assistants, 2nd Year and 3rd Year Student Physical Therapists. We recommend students have some orthopedic/musculoskeletal coursework in their curriculum prior to attending the course. Requirement: In order to proceed to the Pelvic Health Physical Therapy Level 3 course, you must complete the Pelvic Health Physical Therapy Level 2 Bowel Dysfunction AND the Pelvic Health Physical Therapy Level 2 Pelvic Pain course. Both courses must be taken to fulfill the Level 2 requirement. The Certificate of Achievement in Pelvic Health Physical Therapy is an optional route if you wish to take a bigger step towards your career. Section on Women’s Health (SoWH) has developed the Certificate of Achievement in Pelvic Physical Therapy (CAPP) to certify that a physical therapist has completed a comprehensive education, training, and testing program for the management of patients with diagnoses of pelvic health dysfunction, such as urinary incontinence and pelvic pain. The CAPP is awarded to physical therapists who complete four courses of training in pelvic physical therapy (Level 1, Level 2 PP & PH2 BD, Level 3), pass written and clinical testing requirements at each level, and successfully complete a written case report. To learn more, please visit: www.womenshealthapta.org/capp. There are two classes required to complete Level 2: PH2-PP (Pelvic Pain) and PH2-BD (Bowel Dysfunction). Both courses are required to take PH3.